The Email Etiquette Series is all about writing emails that people love to read. In this blog post, we shall explore the art of crafting that survey or customer feedback email that your users will love to respond to. Once you have your product out there in the market, it becomes very important that you make the efforts to find out how it is being perceived by your target users. In other words, you should take the initiative to take a market survey that provides you with the data you need to determine the general response to your product in the market, including information on the most popular features as well as the areas that need improvement. Here are 4 key points to remember when you are drafting a survey email that works. If you have these pointers sorted, you’ll be half way towards success. A survey email is different from other emails you send your users because you’re asking the user to not just open and read the email but also to invest 5-10 min to complete the survey. In such a scenario, it becomes all the more important for you to take efforts to craft a subject line that really catches the user’s attention and makes him/her want to oblige you. Given below are some subject lines that can really make a difference. 1. We Really Appreciate your Feedback. It Just takes 5 min! 2. Share Your Experience of Using XYZ tool. Complete the Survey. 3. Complete this Quick Survey & Get 15% Discount! The first subject line makes the user feel valued. It also mentions the exact time required to complete the survey, which means the user is aware of the amount of time he needs to invest. The second subject line is also effective because it provides a platform for the user to share his experience of using the tool. The third one, by all means, attracts the most attention because it clearly mentions what the user stands to gain in the process. 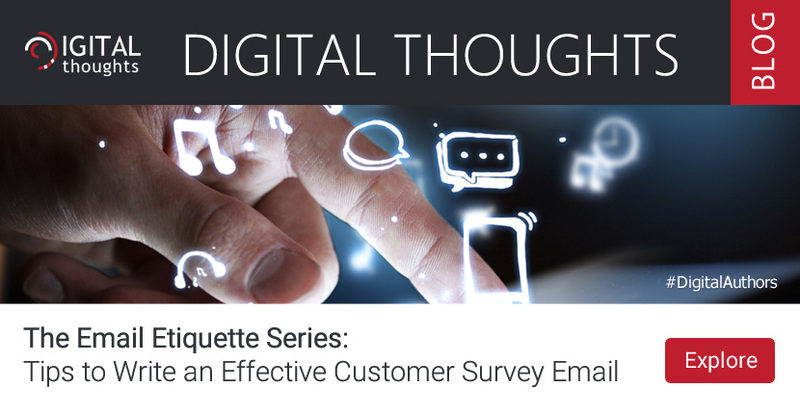 Keeping a survey email short and simple is perhaps the most important concept that can make it work. So, while drafting one, you should make sure that you don’t go on and on about the product/service or the survey in general. Keep it extremely precise, for it pays to understand that your subscribers are really busy people. The key is to make sure they don’t lose interest even before they start the survey. Save lengthy explanations for another day and move straight to the point of what’s in it for them. Unless they are motivated to take the survey, your email campaign won’t be successful. 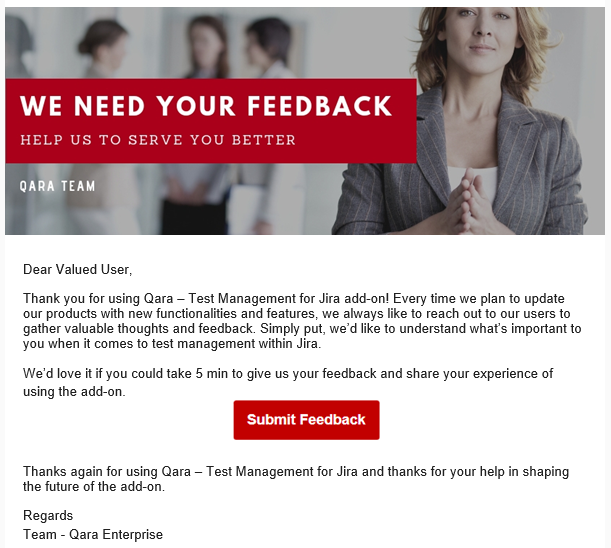 When you are asking your users to fill a survey, it is a great idea to offer them something in return for taking the time to participate and share their valuable feedback. Take time to analyze the key motivations that are most likely to drive your target users to take the survey and then use one in your email. The motivators can be the need to make one’s opinion count, the need to feel important, some special privilege or a reward. For example, you can make a user feel important by mentioning the fact that this survey is only for select users. Also, you can make them feel privilege by designing your survey campaign such that the people participating in the survey will have a chance to visit a location that is not accessible for the masses or even stand a chance to meet a celebrity or the likes. The most common incentive is to offer a discount coupon for people participating in your survey. Don’t wait for the user to click on the Call to Action button to start the survey, for many users might not even reach there! An alternative is to include the first question of the survey within the email body itself. It has been observed that starting the survey right from the email content can improve click-through rates and can result in more users completing the survey. So, why not try it out? After all, a user is more likely to want to click on a single question and a relatively long list of questions (no matter how short you keep your survey) can be intimidating to many. Now that you are pretty much aware of what all things to consider when drafting an effective survey email to seek the feedback of your users, here is a sample email for your reference. We conclude with a few useful tips for you. 1. Make sure the email is mobile optimized. 2. Avoid sending the email too many times. Avoid spam. 3. Do not boast about your product. The email is about the user’s opinion, not yours. 4. Don’t forget to highlight the link. 5. Make sure you put an Unsubscribe button. 6. Make it a point to include a signature. So, you see that writing a good survey email is all about focusing on the little details. Of course, it goes without saying that you must follow the important points for writing an effective business email. Do you wish to share your tips to write an effective survey email? Please leave a comment below. Mukulika Mukherjee is the Sr. Content Writer at The Digital Group with a love for all things tech, besides a passion for the written word. In a career spanning over 5 years, she has penned numerous articles, blog posts and media releases. Her work is primarily focused on the IT industry, including software products, tech companies and start-ups, digital marketing, and more.